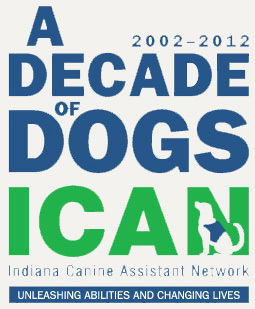 We picked a great year to work with Indiana Canine Assistance Network - it's their 10th anniversary! We're honored to help them celebrate this milestone with a refreshed look. To mark the occasion, ICAN is throwing a bash. A Decade of Dogs will include a dinner/program with special guests, music by Tides and more. The Woof Roof Art Show, ICAN Show & Tail with former handlers, a photo shoot and the ICAN Story will all be topped off with cash bar. NASCAR Champion Tony Stewart and team owner of Sarah Fisher Hartman Racing, Sarah Fisher, are honorary Co-Chairs for the event. Join in on the fun: Saturday, November 10th at 5:30 p.m. Indiana Roof Ballroom 140 W. Washington Street, Indianapolis Get tickets Business casual attire and your best party attitude are required.